Why make a letterpress edition of The Fire Next Time in 2017? This special edition not only celebrates Baldwin’s initial publication of the book in 1963, but it also provides a new text through which readers can access the text of the book in conjunction with significant images from the Civil Rights movement. In addition to being able to view Schapiro’s photographs in the letterpress edition, interested readers also had an opportunity to see an exhibit of the photos at the Fahey/Klein Gallery in Los Angeles, California. The exhibition, entitled Steve Schapiro: Freedom Now, ran from June 15-July 29, 2017. If you have a James Baldwin collection, or if you are interested in collecting books pertaining to the Civil Rights movement, here are more details about this letterpress edition. It was printed in a limited run of 1,963 copies—the number reflecting the original year of publication. 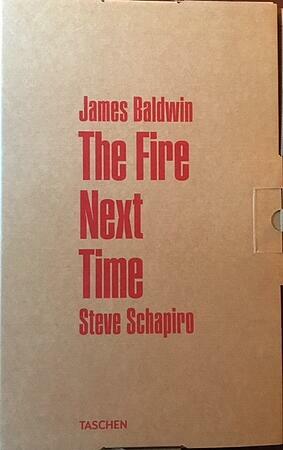 Of those, there are 1,813 numbered copies of a Collector’s Edition, each of which have been signed by Steve Schapiro. These editions include a silk-screened hardcover, an embossed paper case, letterpress printed text, and facsimile reproductions of ephemera from the Civil Rights movement. Three Art Editions were also printed in a limited run of 50 copies each, which include a Steve Schapiro-signed photographic print. James Baldwin authored many other important works including his debut, Go Tell It On the Mountain, which was named one of Time's All-Time 100 Novels. “America, of all the Western nations, has been best placed to prove the uselessness and the obsolescence of the concept of color. But it has not dared to accept this opportunity, or even to conceive of it as an opportunity. White Americans have thought of it as their shame, and have envied those more civilized and elegant European nations that were untroubled by the presence of black men on their shores. This is because white Americans have supposed “Europe” and “civilization” to be synonyms—which they are not—and have been distrustful of other standards and other sources of vitality, especially those produced in America itself . . . There remains so much work to be done if we are to live in a country where equality is a fact. As an article in The Guardian contends: “Schapiro and Baldwin showed the possibility of what strong writing and photography could achieve in their time. In ours, we’d do well to look to them.” If you haven’t read The Fire Next Time, we recommend picking up a reading copy alongside your letterpress edition today.